The far corner of southeast California is for the most part barren desert, extremely hot for much of the year and largely devoid of any plant life. There are few roads and very little settlement, but one substance that is abundant is sand, which collects in the wide valleys between isolated mountain ranges and blows around in the strong, prevailing westerly winds. The largest accumulation is an area of 8 by 40 miles called the Algodones Dunes, a vast pile of pure, golden sand, center of which has absolutely no vegetation and presents a stark, elemental scene of just two components - cloudless blue sky above and unbroken sandy mounds beneath. The shifting sands and bright sun impart an unusual soft, bluish tint to the dune surface. 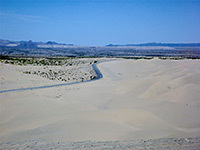 Approaching from the east along I-8 in Arizona, the Sonoran Desert surroundings become ever more sandy once past Yuma and over the Colorado River, and the interstate crosses the leading edge of the dunes 8 miles later. They extend a few miles south, across the border with Mexico but most lie to the north, although the immediate vicinity is a closed area - a section of the Yuma Proving Ground - and is used by the military for weapons testing. At the far end, the dunes narrow and merge with salt flats around the south edge of the Salton Sea. For a closer view, take S34 north at exit 166 then turn left at Ogilby along the unpaved, dead straight Ted Kiph Road which runs close to the eastern foothills. After 18 miles and about half way along the dunes, this meets CA 78 at the tiny town of Glamis; this road then winds right across the middle of the sands, and has several viewpoints and stopping places. The land south of CA 78 is used extensively by off road vehicles which spoil the otherwise peaceful atmosphere, but the north is a designated wilderness area and open only to travel on foot, though there are no official trails. Glamis and the nearby land around county road S34 is the main location for (free) camping in the desert hereabouts, and many thousands of RVs congregate nearby in the winter months. 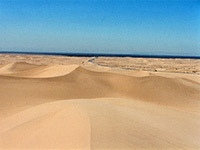 At the far side of the dunes, the land becomes quite flat, remains sandy for several miles then quite abruptly becomes irrigated and cultivated - this is the Imperial Valley, a large area mostly below sea level. The soils are unusually fertile as this was once the course of the Colorado River before it changed course in 1905.